Today the Threadneedle Prize Exhibition opens to the public, having been online since 14th August. I had a chance to see it yesterday while the hanging was being finalised and have had a good look at all the shortlisted candidates. suggesting which works would have been my shortlisted candidates! See if you can spot a potential winner in your eyes and then exercise your right to vote for your choice as to which work should be the winner of the Threadneedle Prize! For those not familiar with the Threadneedle Prize I can't do better than quote the introduction on its website. This competition is a showcase for the best in contemporary painting and sculpture, open to all artists - established and emerging talent - aged 18 and over, living or working in the UK. Approximately 60 works, selected from a national open submission, will be exhibited at the Mall Galleries, London in September 2009. Two major prizes are available: The Threadneedle Prize (£25,000) and a new Emerging Artist Prize (£5,000). Each of the six runners-up for The Threadneedle Prize receive £1,000. Seven works, nominated by the panel of selectors, are shortlisted to win the £25,000 Threadneedle Prize. The artist who receives the largest share of public votes cast online and throughout the exhibition wins the Prize. This is my overview of the shortlisted artists. I've not yet voted however if you read my review you'll find out which are the two works which are in the running. See my posts later this week for my personal shortlist and more about the artist who's won the Federation of British Artists Emerging Artist Prize (£5,000). Artists are invited to submit representational and figurative work that retains a strong reference to the real world, executed in your chosen medium of art, painting or sculpture (but not photography or video). Work must be based on observation, rather than concept or abstraction. All themes are admissible; traditional as well as innovative interpretations are both welcome. First off, I don't think it's a strong shortlist. I think last year's exhibition and last year's shortlist were both better. The exhibition also includes works which I would have included in this year's shortlist in preference to some of the ones which are. While we all always have different views about which pieces merit shortlisting it would appear that how the judging worked this year was 'interesting' and I'll comment further about this later in the week. I'll also be providing you later in the week with my alternative shortlist. The idea of an alternative shortlist was one which emerged as I went round the exhibition. Regular readers of this blog will know that I very rarely say what I don't like about artwork on this blog. That's because I'm mindful of the potential impact of comments which go on forever on the Internet. I've only ever made an adverse comment about an artist on this blog once (unless they were called Damien Hirst). However this year I'm moving towards the view that if you are submitting your work to a serious competition for serious prize money then I'm entitled to say what I think - or I must do what I usually do and refrain from any comment at all. So this time around, I'm saying what I think however some comments may be very brief! Shortlisted artists are listed in alphabetical order with the title of the shortlisted work and its price. This is an oil painting on a small panel with a narrative which didn't say a lot beyond the obvious. It's a nice painting - but it's not the sort of portrait I expect to be looking at as part of the shortlist for a major prize in an art competition which is championing figurative art. I'm not entirely clear how she works. It seems as if she does the watercolour from memory and then creates the oil painting from the watercolour but in a way which makes it distinctive. On the whole I think I'd liked to to have been able to see the original watercolour painting from which this was painted. Simply to see how she responded to what she saw in front of her. For example I much prefer this watercolour on her website. Judging by her narrative it looked like she was marketing her links to the Flowers East Gallery and her recent exhibition called Stepping out into the world beyond. It's certainly the case the Gallery is lobbying for votes for her work on their website - an activity which is always complete anathema to me and provides me with a very good reason NOT to vote for this work. 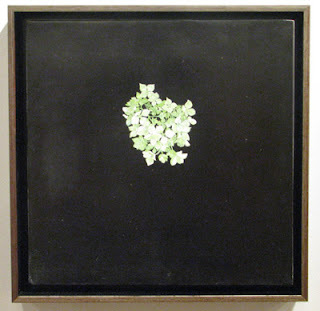 Given that I love paintings of plants you might think I'd like this work - but I don't. I actually don't understand why this piece has been shortlisted. Could it be because this artist has regularly got work into exhibitions associated with art competitions? Tim Shaw was also short-listed last year and won the selector's prize in 2008. He was the artist whose work was criticised by me last year (See Threadneedle Figurative Prize (part 3) - Brandford, Shaw, Williams and the DVD). However I'm very pleased to say that this year, I'm taking a very different view. Helped in part by being able to talk to the artist as he was setting up the lighting for this work which has a room to itself right at the far end of the North Gallery. You can see him in the picture at the top of this post. What can I say about The Middle World? For me it made me think of a giant pinball machine and huge gothic cathedrals at one and same time! It's massive and detailed in the same way that cathedrals are and has a quiet authority about it - but one which also seems to have an element of menace. At the same time it made me also think it was part of some fantastical game. It includes very small bronze figures which seem to have come out of medieval paintings - I kept being reminded of the figures in the imaginative paintings of Hieronymus Bosch. I spent some time trying to work through all the sources that have influenced the work. 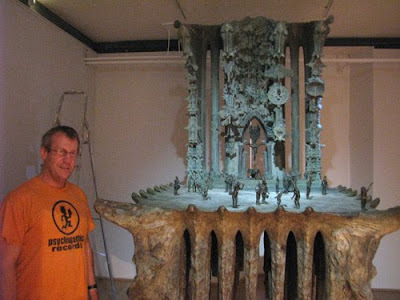 It's made of cement, steel and bronze and Tim has been creating this work for the last twenty years having started it in 1989. In 1995 he brought it to London. In the last two years he's been reworking parts of it. The current layout of the small figures is very structured and one could spend a lot of time looking at it to try and understand whether the figures have meaning, whether there is a story or whether the figures are totally random. 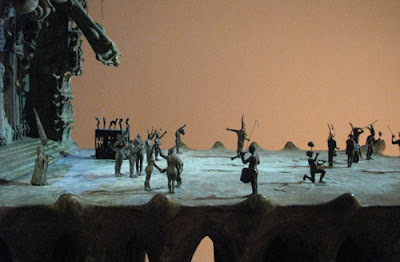 I found the moulding and detailing of the small figures to be utterly absorbing. Also the sides of the 'altar' at the back are very elaborately decorated - just like in a cathedral except in this instance there are lots of tiny skeletons in place of statues of the saints! I can imagine this piece being bought by a rock star with oodles of money. However Tim told me he'd really like it to be bought by a museum for public exhibition and I think it's a piece which certainly merits serious consideration. However I rather suspect he'd like to continue to work on it some more before he lets it go forever. The bottom line - I didn't expect to like this work - but I did. I also think it is one of the most original and accomplished pieces in the exhibition and certainly within the shortlist. It's definitely a candidate for my vote. This made me think of Dali's Christ of Saint John of the Cross. Having thought of that I couldn't get it out of my head every time I looked at it. 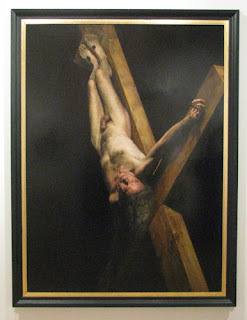 However the artist says that the painting is inspired by Caravaggio's The Crucificion of St Peter. My sources say St Peter was an old man when crucified but, call me literal if you like, to be honest this doesn't actually look very much like an old man to me. I wanted to evoke some of the darker aspects of the human condition, emotions that we pass through every day. Feelings of persecution, disorientation and trauma but expressed in a beautiful way. What's beautiful about persecution, disorientation and trauma? Doesn't presenting persecution, disorientation and trauma in a beautiful way make such activities seem much more attractive? I'm really not at all happy with that line of thinking. I also personally don't think portraits of St Peter have an awful lot of relevance to the modern world. 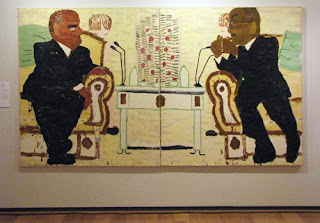 This is my favourite painting in the shortlist because, in my view, it's the best painting. The pose means that this is not a comfortable painting to look at (I'm not a fan of 'in your face' nudes) or self-portraits which can only have been painted from a photograph. However there's something about the overall design and composition, the value pattern and the sensitivity of the colours used in this painting which makes you want to walk over to it and look...and linger, at which point you also admire the brushwork too! Unfortunately, if it was in a competition to win prizes for presentation it would get marked down as its frame is really not doing it any favours at all and it would have been better presented simply as a board. So lots of caveats - but still one of the pieces I liked the best and a candidate for my vote. This work is HUGE and is being hung on the prestigious end wall of the west gallery. It's actually a diptych - but is hung in such a way you'd probably not notice never guess unless you looked at the catalogue. I didn't quite understand that. I'm not a huge fan of heavily stylized figures - just as I don't like manga figures or comic book characters. It's a personal thing. I like my figures to be real. Consequently this piece lost me early on in terms of trying to appreciate its value. However I would agree that it's appropriate in an exhibition about figurative art to have a piece which has been painted with metaphor and meaning. Voting closes at 12 noon on Monday 14 September 2009 and the Prizewinner will be announced later in the day and on the website. You can vote at the exhibition or if you can't get to the exhibition you can still vote online via the website on a one email one vote basis. The artist who receives the largest share of public votes throughout the voting period, cast online and at the exhibition, wins the £25,000 Threadneedle Prize. Last year I was the first person to vote in the gallery - and I voted for the winner! It's a different sort of exhibition this year. I think I need to go back and see it again once it's properly hung and I can get a clear view of the whole space. My initial inclination was to think it wasn't as strong as last year. More comments later this week. the artist, writer and curator, Cathy Lomax (Cathy Lomax). They were joined by Desmond Shawe-Taylor, Surveyor of The Queen’s Pictures. the exhibition for the new Threadneedle Figurative Prize (part 1) (August). Well...yes, its different this group of selections for this year. I like seeing different interpretations and styles, even if they don't all appeal to me - and they won't. I do often wonder how the final pieces are chosen in exhibitions and how much personal preferences come into it, despite the need to be impartial. Good post K, am facinated to see what gets in and agree with most of your comments. I expect Tim Shaws is much better in the "flesh" but it reminds me a bit of the warhammer games that my kids used to make and play, wonder if he did! Love the self portrait and yes the frame looks rubbish. Interesting to see who wins. I found Tim Shaw's Middle World very intriguing-but I am not certain how well or poorly it translates from photo to in-the-flesh. I actually like Jaemi Hardy - Clara with Chinese Horse. Can't exactly say why. 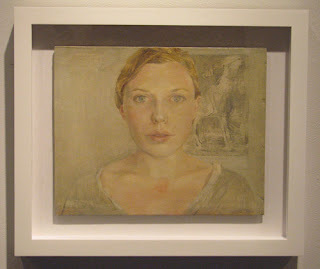 I adore Sheila Wallis' self portrait out of all the works you linked I like this one the best. Thanks for this post-it was a great read. 6th September 2009 - Who's made a mark this week?